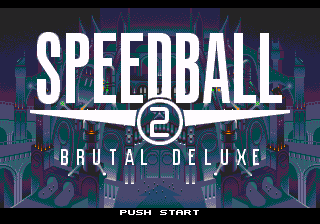 Speedball 2: Brutal Deluxe, known in Japan as just Speedball 2 (スピードボール２), is the sequel to Speedball. Originally released for the Commodore Amiga and Atari ST in 1990, it was ported to the Sega Mega Drive and Sega Master System in 1991 and 1992 respectively. In Europe and Japan, the Mega Drive version (released in late 1992), features reprogrammed audio, giving the game extra music that is absent in the North American version (just like the home computer originals). The game is a faithful port but colors are a bit more on the saturated side as the systems are unable to reproduce the colors used in the Amiga/Atari versions due to the more restricted master palettes lacking the required pastel colors. Main article: Speedball 2: Brutal Deluxe/Magazine articles. Main article: Speedball 2: Brutal Deluxe/Promotional material.